Idaho, Oct. 9 (BNA): His Highness Shaikh Nasser bin Hamad Al Khalifa representative of His Majesty the King for Charity Works and Youth Affairs, Chairman of the Supreme Council of Youth and Sports and President of Bahrain Olympic Committee, today affirmed that he enters the World Triathlon Championship challenge on Saturday in high morale to realize the achievement in Kuna City, Idaho, USA. 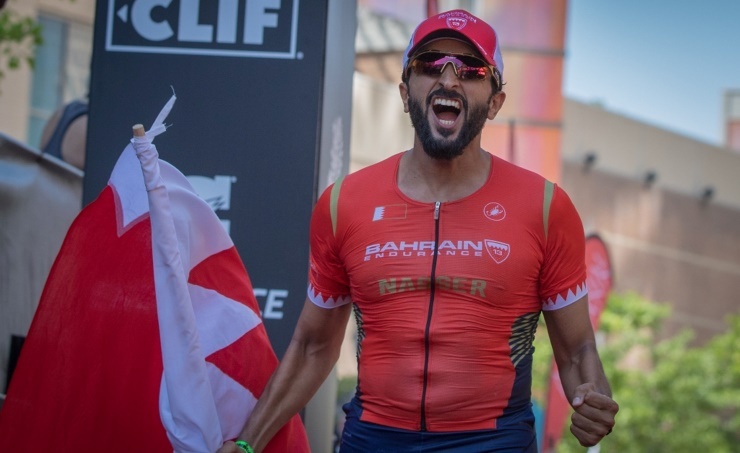 HH Shaikh Nasser said there is no goal before him in the World Triathlon Championship other that achieve an advanced positive result that proves his meritorious high-achievement in the Iron Man’s sport by virtue of his high morale spirit and the accomplishment he had made. He added that he had undergone rigorous training in order to attain physical and technical perfection. He also revealed that he currently enjoys outstanding strength and persistence and insisted on attaining the goal that he set for himself as he is capable of the feat with Allah’s permission, adding that all conditions have been paved to achieve his goal, praying that Allah will help him to succeed in reaching the finishing line and achieve his aspiration. His Highness went on to say that the training continues according to preset plan and he was nearing the final touches of his training, including implementation of the technical plan which will apply to the championship and to overcome the challenges of swimming, cycling and jogging. HH Shaikh Nasser acknowledged that the championship will not be easy but intermingled with difficulties and the participation of champions from around the world increases the severity of competition. He said the winner’s identity cannot be foretold, however, he said he possesses the willpower and resolve to honour my country the Kingdom of Bahrain and promote it through the accomplishment that I am seeking. HH Shaikh Nasser explained that everybody here in Kuna speaks in the same language of challenge and insisting to achieve the accomplishment, as visibly reflected in the eyes of the participations in their enthusiasm and smile for being present in this major international function. These are moments of joy however fraught with apprehension of the race. Everybody realizes the importance of achieving the accomplishments via a water-proof technical plan based on the distribution of physical effort over the three stages in a special manner, he added. His Highness Shaikh Nasser bin Hamad Al Khalifa concluded his statement by saying that we will exert the efforts in order to reach the goal as we have previously achieved many goals but it remains to win the World Triathlon Championship which is the most important and the glittering. Our aim is clear and we seek to reach the finishing line, only there and then the joy will be overwhelming to hoist the Kingdom’s flag and achieve an advanced position – God willing.